Ok, I know my week of apple recipes is over but I couldn't resist sharing one more with you (I still have a peck of apples to play with). This Apple Galette was our Sunday night dessert. Warm cinnamony apples & a flaky crust...yum! In a small bowl mix the flour, salt & sugar together. Add the butter & use your fingers to rub it into the flour until a coarse meal is formed. Add the cold water 1 teaspoon at a time until the dough forms into clumps. In another small bowl mix the apple slices, sugar, flour, lemon juice, cinnamon & salt. Let sit for about 15 minutes so the apples can soften a bit. Preheat oven to 425 F. Prepare a baking sheet with parchment paper or a silicone pad. In a lightly floured surface roll the dough out to two 6-inch circles, about 1/8-inch thick (I roll it right out on my silicone pad so I don't have to move the finished galettes.) Divide the apples between the two dough circles leaving about 1-inch around the edges. Fold the edges up over the apples pleating as you go. Brush the dough with the melted butter. Then pour the remaining butter over the apple filling. Bake for 15 minutes until crusts are just beginning to color. Turn the oven down to 375 F & bake another 25 minutes, until apples are soft & crust is golden brown. Allow to cool a bit before eating. A busy week for us...Wednesday night we're going out to The Corner Table to celebrate our two year wedding anniversary. Thursday we have a happy hour with Cookin' Minnesota at Bulldog N.E., now that place has some awesome burgers. Friday night we head off to Austin, TX for Maker Faire & some good BBQ! Let me know how things are at the Bulldog. I've heard it's fallen off a bit with changes in the kitchen, but you never know for sure unless you go there yourself. I always appreciate a good tip! Have fun in Texas! That looks and sounds delicious! I definitely need to try that out. Thanks! Who cares if apple week is over - keep them coming!! I think you should go for a month of apple recipes - I have been loving these! Now aren't you the apple of my eyes...it's nice when the ice cream is half the dessert! I love apples, keep em coming! And I too have that butternut risotto on my recipe menu for some time this week. It looks so good doesnt it? Have a wonderful anniversary dinner! 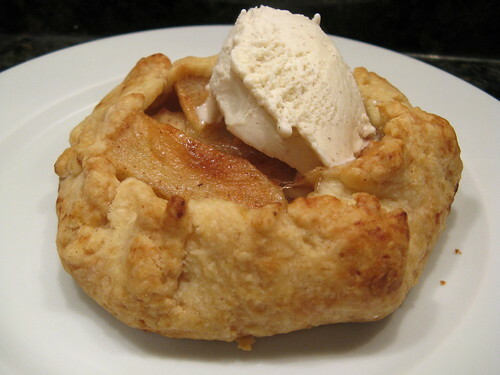 oohhhh ahhhhh.I love apple galette. two years, eh? congrats, and have a glorious celebration. What about the freezer pickles?